Hodder & Stoughton will publish my first paperback book on 9 April 2015. 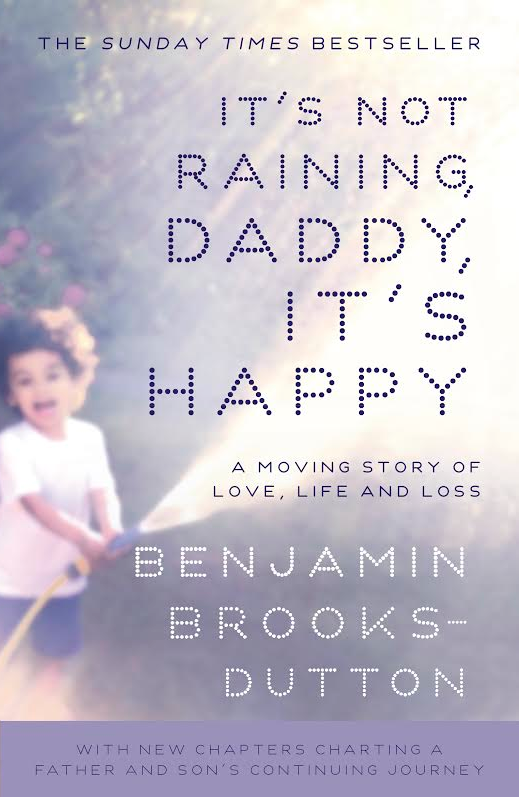 The memoir is dedicated to my beautiful wife and son and I have written it on behalf of anyone who has been touched by the pain of loss and grief. To pre-order just click on the book cover image below. Best of luck with your book,i know it will help a lot of people. First time that i really get stock reading a blog and im really looking foward to read the book! Have been reading your blog for a while now and pre-ordered your book. Amazon were incredibly efficient and it turned up two days ago and I’ve just finished it. I cried, I laughed and ended up feeling like I’d have wanted to be mates with Desreen (I hope that doesn’t sound weird). The loss of your grandma also struck a nerve. My grandma lived opposite us and looked after me while my dad was in hospital when I was little. She became one of my closest friends and was the only one in on a number of plans, including the great “Take Secret Driving Lessons and Tell Nobody Until I Passed’ plan and was thoroughly thrilled about it. She’s been gone 8 years this year and I miss her every day. It still infuriates me that some people assume the death of a grandparent should be somehow easier to cope with because it’s the ‘natural order of things’. That’s crap. My grandma was as involved in my upbringing as my parents were and losing her was just awful and left a void that’s never going to be filled because she was my Grandma and now she’s not here. I know you’ve heard all this before and will probably cringe at the word inspirational, but you’re helping a great many people and I wish you nothing but the best, in whatever form that may take. Jackson sounds like a great kid and is clearly a credit to you both. I just caught the end of your chat on Radio 4. Your comment that you had to just get on and be a father to your son whilst trying to come to terms with what had happened resonated hugely with me. I lost my wife to breast cancer in August 2012. It was only 8 months after her initial diagnosis. I had dealt with bereavement before having lost both my parents within 11 weeks of one another when I was 20 but the loss of my wife has been so much harder. My wife was 36 when she died and I was 46. We had met 12 years earlier whilst serving in the military and were married for 10 years. We were living abroad when she was diagnosed and continued to do so until it was apparent that things had gone dreadfully wrong so we chose to come to where I am from in Scotland to get support from my older siblings and their grown up families. I had not lived in Scotland for 25 years. At the time of her death our children were 3.5 years old and twins of 14 months. For me, it has been extremely challenging to try and make time to come to terms with what happened, to grieve properly, whilst trying to get on with the day to day task of raising 3 small children. Coupled with that I am in a place that I have not lived for 25 years, where people barely knew my wife (she was from London) and I have had to establish a new family home etc. On your blog, you mention helping Jackson grieve. Personally, I have had such mixed feelings on the subject of this with my children. I am devastated that our children, the twins, were too young to know their mother but also relieved that I have only had to deal with my own grief and not that of my children. Our eldest has had moments when he’s clearly been upset but it’s been when I am upset and I feel that he’s only upset because I am upset. What I am however grateful for is the amount of video I have with either my wife in the picture, or, her voice, as she is actually taking the video. I have absolutely nothing like that of my parents. I believe my eldest will never forget what his mum sounded like or moved like and the twins will learn to identify her voice and to see what a beautiful, fun person she was. Back to me. I was 34 when I met my wife. I had had, a couple of longish term relationships before that but since her death, I have only chatted with 1 girl (I meet a lot at all the “Parent & Toddler” groups) whom I have found as remotely interesting as she was. It frustrates me hugely that people have the assumption that you will move on, find someone new, etc, etc. Yes, for the sake of the children, I have got to find some state of happiness but it took me years to find my wife. I’ve sort of run out of steam for now but it has been interesting for me to find your blog and to write my comment. I dont know you and I dont know the blogger but I’m moved by both of your stories. I’m incredibly sorry for your losses. If the screen were a place that you both could feel arms wrapped around you, I’d love to give you both hugs. I’ve never lost anyone. My husband and I have beautiful children, but I believe what struck a nerve is your utter honesty of coping. I hope you find peace within yourself, I hope your love can be shared again, I hope your children can keep their memories of their mother, and I wish you joy for your remaining days. So very sorry for the loss. I myself have had many losses. I am in my 40s and lost both my dear parents 11 years ago. First my Dad and then my Mum 6 months later. I was devastated but to add to it myself and my husband lost our 3rd baby when I was carrying her at 37 weeks. I gave birth to our dead baby. This was a couple of years after my parents had died. It really felt like all of the deaths were in quick succession. I felt like. I could not breathe with the grief. I also experienced sibling problems which have continued for 11 years. I have struggled on and the sadness is so overwhelming at times. I feel like even though I have come to terms with my Dads, Mums and babies death. I have not come to terms with the loss and disconnection of my brothers and sisters, they are still alive but feel like they are dead because of the disconnection and dysfunctional nature of my family.Hopefully one day this pain will heal. You can heal but it takes time, sometimes it feels like you will always have to pretend you are happy when underneath you are not. But I assure you one day you will feel more able to cope and you will feel the healing that you need. I’m so sorry for your loss. You write beautifully and amazingly. Just so sad and devasting to lose your partner. Soul mate and father to your children. I was so sad to read your story my friend told me back in Jan, but I couldn’t even email. I think she worked with in PR before this tradeady in your life.